Sunny is somewhat of a canine celebrity in her hometown of Louisville, Kentucky. She has been through a lot. And while her claim to fame may not be a very pleasant first chapter to her story, the rest of Sunny’s book is loaded with courage and inspiration. In 2009, Sunny was just a puppy when she was thrown off a bridge and into the Ohio River along the Louisville waterfront. Onlookers were stunned as they watched her drop 80 feet in broad daylight. Fortunately for Sunny, the horrified people at the scene took action. A group of firefighters in training helped rescue her from the water. Kelsey Westbrook, a kind-hearted waitress, saw everything. She raced to the water’s edge and shouted at Sunny to help direct her towards the shore. The traumatic event changed both of their lives forever. Kelsey went on to adopt the resilient Pit Bull Terrier and the two have been inseparable since. Their meeting also helped Kelsey find her career path. 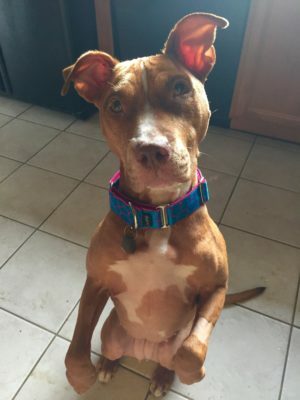 A college student at the time, she went on to form Saving Sunny, an organization that rescues, re-homes and advocates for Pit Bull Terriers and similar dogs. But, seven years later, Kelsey was floored when what appeared to be a chronic ear issue turned out to be cancer. Sunny’s discomfort was caused by fibrosarcoma, a soft tissue sarcoma that had grown into a very large tumor on the roof of her mouth. Initially, surgery was able to remove 90% of the visible mass. But the tumor extended further back into Sunny’s face and behind her left eye. It also continued to grow aggressively. With limited options and a significant concern for Sunny’s quality of life, Kelsey found out about stereotactic radiosurgery (SRS), a new, advanced form of radiation therapy for pets that recently became available in nearby Cincinnati at PetCure Oncology at Care Center. She diligently began to research SRS, a noninvasive therapy that is delivered in 1-3 short sessions with minimal side effects. “We might actually have an option here,” she thought. And she did. Sunny received three treatments of SRS in late February and immediately returned home. Two weeks later, a follow-up visit with her local veterinarian indicated that everything was going well. Sunny’s energy was up and she was back to going on walks and hikes with Kelsey. Her side effects were mild and indicated that the tumor was reacting to the radiation therapy and slowly dying.